I crave a warm blanket and a good movie. In my youth I was quick to run to a spa. It didn’t matter the type. Either I was going to get a 30 min upper body massage or I was spending the day there until I went broke. The last gym membership I had was paid for in blood every month directly debited from my left ventricle. After paying with my arms and legs, I had nothing to sign a check with or swipe a card with so they took the payments out automatically. Boy was it worth it though! I’d work out any time of day or night and they had a pool, jacuzzi, and fully equipped salon and spa services. Felt like a new woman every time I left. Now, I’m older and I have more pressing responsibilities and I can’t indulge like I used to. So yesterday while waiting for my 10 minute oil change, I spotted some relief! A leather lazy boy looking humble piece of furniture labelled “Spa on the Go.” For less than the price of a McDouble I could get a few minutes of tranquility. 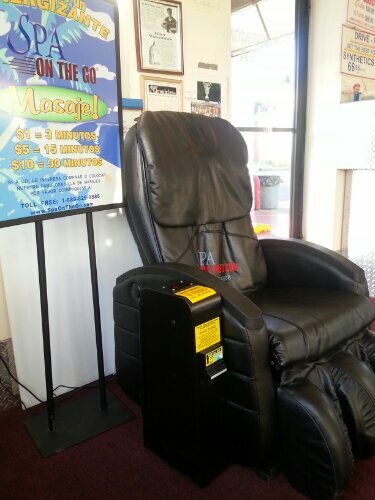 A pre-programmed massage. It felt a little rough but it did the trick. Surrounded by the smell of oil, stale/free coffee, and a great view of the main busy boulevard, I created my own little sanctuary. It was a sign that sometimes you don’t need to get “turnt up.” Sometimes you need to rediscover the miniscule things that give you temporary moments of peace. Sometimes it’s the sound of a melody that stimulates a mood of positive memory revisiting. Think about the first time you put a set of chrome pegs on the back of your bike. Trust me, its better than obsessing over the next car note payment. Think about your first Nokia phone that you played the game Snake on. Sitting in the back of the bus eating a honey bun. Playing Spades. Calling home because there was no such thing as text messaging. Don’t think about the phone bill due. Get ‘turnt’ down or ShutYaMouthAndCallMeUgly.